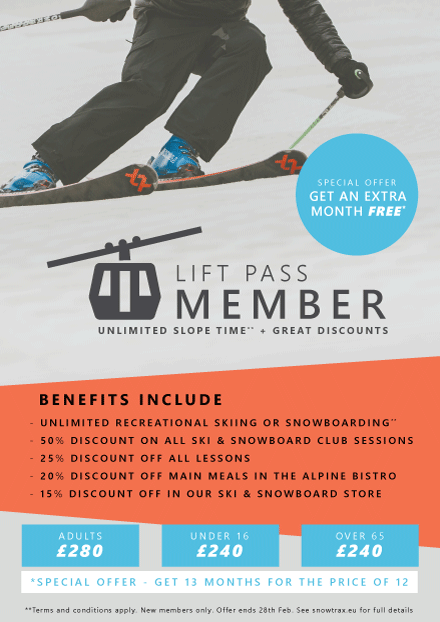 Why not buy one of our lift passes and receive massive benefits, including unlimited recreational practice, discounts in our shop, personal invitations to ski & snowboard test nights, promotional events and much more! How do I become a Lift Pass Member? Or drop in to the Centre and speak to one of our friendly reception team! ** Subject to slope availability. If you wish to hire equipment, a charge of £3.95 applies per open practice session. Lift passes are available to purchase all year round & run for 1 year from date of purchase.